My root partition is/has run out of inodes. Since it is a 500GB disk and the Disk free tool was showing ~30 GB in use, my plan was to shrink the root partition, create a second logical ext4 partition (tuned to have more inodes), and move some paths onto that. My system contains a 500GB nvme device, on which there are two plain partitions. 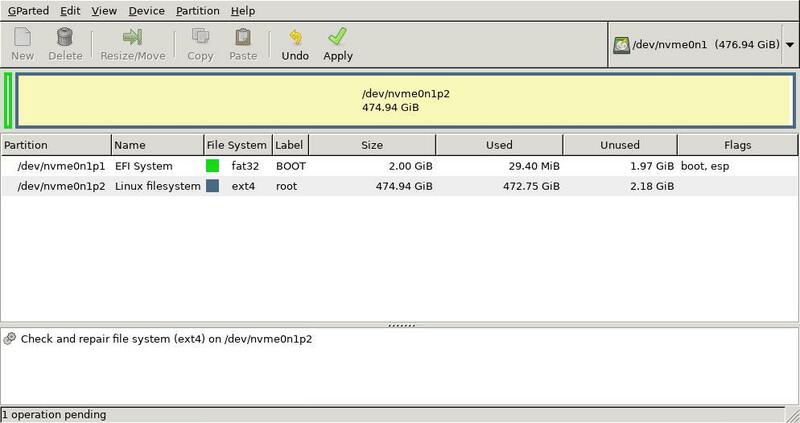 A fat32 boot partition, and a single ext4 system partition. When I booted into gparted live, it showed the root partition as mostly full, which confused me greatly, and is why I'm posting here. This is strangely similar to a recent post (id=17776, but I can only include 1 link apparently) but altogether different, because this partition on my computer doesn't use LVM. It is a plain ext4 partition. Since that post has a lot of good guidance on what info to post, I have included that below. 3. Mounted file system usage. 4. File system minimum size and super block dump. (This assumes the file system is ext4, ext3 or ext2. Replace /dev/sda2 with the actual device name). Hrmm, that resize2fs output is interesting. Hopefully someone with more knowledge than I knows what to make of that. I'll include an extra invocation of df to show the inode count in another way, and to serve as a solemn reminder to myself about what I've done. Is there some safety percent for reserved free inodes or something which is causing an issue? Excellent report. You have provided all the information I need. resize2fs reports that the minimum size the file system can be shrunk to, is 123929873 (measured in file system block size units). dumpe2fs reports the file system "Block size" is 4096 bytes. Multiplying this out, the minimum size the file system can be shrunk to is 123929873*4096 bytes ~= 472.75 GiB. As GParted is a file system resizing tool, it has to use this figure as the "Used" figure to prevent trying to shrink a file system smaller than it's minimum. EXT file systems store inodes at fixed location across the file system. So because your inodes are almost 100% full your file system can't be shrunk as the inodes as the end of the partition are in use, even if there is over 400 GiB of space for storing file data. The fact that your file system has so few inodes is unusual. I created a test ext4 file system on a 474 GiB partition and got 31,064,064 available inodes, where as your file system only as 486,400 available inodes. I recommend doing a file level backup, recreating the file system and restoring the backup. Then probably also having to fix booting.